Welcome to South Africa, and to the cosmopolitan city of Cape Town. On arrival, you will be met and transferred to your hotel for a welcome briefing from your Tour Director. Today, explore the beautiful Cape Peninsula. Enjoy the spectacular views from the summit of Cape Point, then visit Boulders Beach, home to the protected land based colony of African penguins. Enjoy lunch at a local restaurant in Simons Town. Enjoy a city tour including a cable car ride to the top of Table Mountain (weather permitting). The rest of the day is at leisure. Discover More: Township tour, Cape Winelands tour or Robben Island (additional cost). Travel through the mountains of the Western Cape then along the beautiful Garden Route to Knysna. This afternoon enjoy a sunset cruise. Continue along the Garden Route through Plettenberg Bay and the beautiful Tsitsikamma Rainforest before arriving at Addo Elephant National Park, the third largest national park in South Africa. An early start for your morning game drive in open safari four wheel drive vehicles. Look out for close up photo opportunities of the ‘Big Five’ elephant, rhino, buffalo, lion and leopard. In the early afternoon, enjoy a traditional African high tea before your afternoon game drive. Return to the lodge where dinner is included. Leaving Addo, drive to Port Elizabeth for your flight to Durban (flight not included, book flight after 1:00pm). Travel north into the magnificent World Heritage listed Drakensberg Ranges through stunning mountain scenery before arriving at your hotel, perched on the slopes of the 3004 metre Cathedral Peak. Today is at leisure for you to enjoy the magnificent surroundings of the Drakensberg Ranges. Travel north through Natal, into the independent kingdom of Swaziland, where your hotel is located in a picturesque valley en route to Kruger National Park. Continue to the world famous Kruger National Park, home to many hundreds of species, cats, antelope, as well as the ‘Big Five’. Drive by coach through the park to your hotel where you enjoy an outdoor ‘boma’ highlight dinner (weather permitting) to taste some of the delights of Africa. Start early this morning for your game drive in customised open safari vehicles. A light bush lunch is included before your afternoon game drive commences. Travel along the ‘Panorama Route’ and view the stunning Blyde River Canyon, the third largest canyon in the world, and one of Africa’s natural treasures. Visit the Bourke’s Luck Potholes and stop at World’s View. Depart the hotel this morning for your transfer to the airport to meet your flight (flight not included) to Victoria Falls, Zimbabwe. On arrival, see one of the most spectacular natural sites, Victoria Falls. You’re Invited: Travel to Chinotimba township to experience life in a truly African community. Enjoy a cruise on the Zambezi at sunset. Travel just across the Botswana border to your lodge at Elephant Valley. Tonight, enjoy an included outdoor ‘boma’ dinner (weather permitting). This morning is your cruise on the Chobe River, where hippo, elephant and buffalo inhabit the shallow waterways. 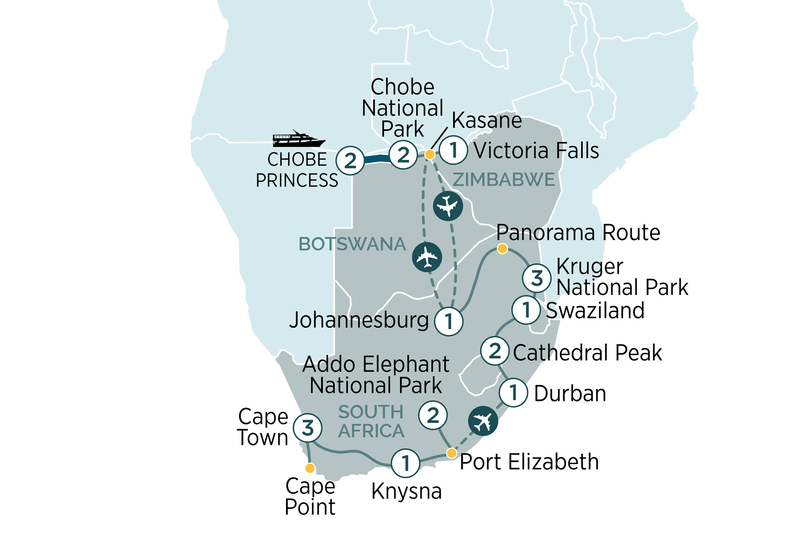 This morning, join your river cruise ship, the Chobe Princess. Enjoy an afternoon sailing with sightings of hippo, elephant and buffalo a regular occurrence. Tonight, enjoy dinner on board. After breakfast on board, enjoy bird watching, fishing, or other activities, or just relax on the upper deck watching the wildlife. This boutique vessel is small enough to navigate the smaller inlets and Chobe River, which is a lot shallower than the Zambezi where the larger ships remain. Tonight, watch the sunset over the Zambezi over a three course meal with wine and beer included. Disembark your river cruise and transfer to Kasane airport for your flight (flight not included, book after midday) to Johannesburg. Transfer to your onward flight home or book extra nights in Johannesburg if required (book flight after 6pm).